For quantitative determination of alkaline phosphatase (ALP) activity using stable 4-methylumbelliferyl phosphate substrate. • High sensitivity and wide linear range. Use 10 μL sample. Detection limit of 0.02 U/L (20 min reaction). • Homogeneous and simple procedure. Simple "mix-and-measure" procedure allows reliable quantitation of ALP activity within 20 minutes. • Robust and amenable to HTS. All reagents are compatible with high-throughput liquid handling instruments. 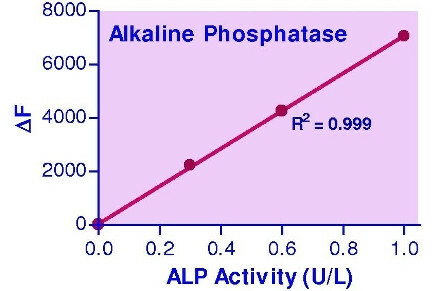 Alkaline phosphatase (ALP) catalyzes the hydrolysis of phosphate esters in an alkaline environment, resulting in the formation of an organic radical and inorganic phosphate. In mammals, this enzyme is found mainly in the liver and bones. Marked increase in serum ALP levels, a disease known as hyperalkalinephosphatasemia, has been associated with malignant biliary obstruction, primary biliary cirrhosis, primary sclerosing cholangitis, hepatic lymphoma and sarcoidosis. Simple, direct and automation-ready procedures for measuring ALP activity in serum are becoming popular in Research and Drug Discovery. This improved method utilizes 4-methylumbelliferyl phosphate that is hydrolyzed by ALP into a highly fluorescent product 4-methylumbelliferone. The rate of the fluorescence increase is directly proportional to the enzyme activity. 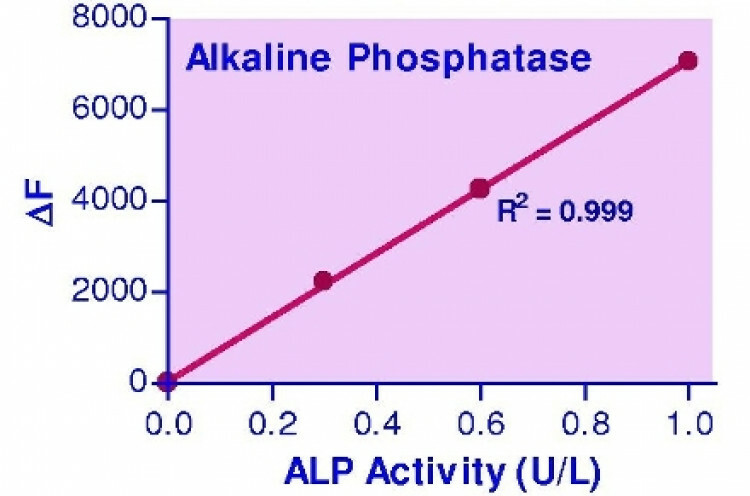 Applications For quantitative determination of alkaline phosphatase (ALP) activity using stable 4-methylumbelliferyl phosphate substrate. References Assay: Cells in Rats. (Pubmed). 1. Laura, BP et al. (2015). Lasting effects of butyrate and low FM/FO diets on growth performance, blood haematology/biochemistry and molecular growth-related markers in gilthead sea bream (Sparus aurata). Aquaculture. 454 (2016) 8?18. Assay: Plasma in Fish. 2. Maryam, RR et al. (2015). The role of dentin matrix protein 1 (DMP1) in regulation of osteogenic differentiation of rat dental follicle stem cells (DFSCs). Arch Oral Biol. 60(4): 546?556. Assay: Cells in Rats. (Pubmed).